Time set aside for healing, detoxification, weight loss and breaking addiction. Among the sea of weight loss information out there, these are twelve of the most important truths in understanding how to lose body fat and keep the pounds off forever. A three month diet program, helping you transition from unhealthy eating habits to a life-long healthy diet. Standing in line recently at the checkout of my local supermarket, I glanced over at a display of magazines, strategically placed and competing for the attention of unsuspecting shoppers with their shouting headlines. It always amazes me, month after month, the hundreds of new superstar-touted diet programs that keep appearing, with secret supplements and painless exercise regimes, all promising magical health, weight loss and beauty. And we buy into it, hoping that the next formula will transform us into models, or at least a similar facsimile of their perfect bodies. Insomniacs are all-too familiar with every new elastic-band contraption showcased on late-night infomercials, pledging to sweatlessly melt the pounds away with herbal appetite suppressants, subliminal audio tapes, fat blockers, or fat-free, carb-free, all-protein diets, to name a few. And to add the confusion, best-selling books from doctors promoting a multitude of new diets such as the Low Carbohydrates Atkins Diet or The Zone. For the poor soul who wants to lose weight, there is a multitude of conflicting, confusing information coming from reputable people in the medical field who each believe they have designed the prefect system. These programs often emphasize reducing one of the three essential macronutrients. For example, some diets promote eliminating carbohydrates while eating high amounts of protein and little fat. 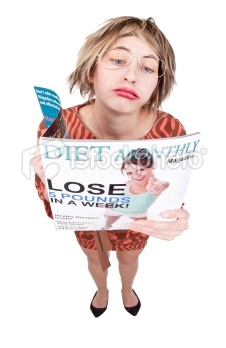 There is no doubt you will see weight loss, but at what cost to your health and mental clarity? When a patient asks her family doctor what she should eat to safely lose weight, the response is to eat a balanced diet. But what exactly is a balanced diet? Doctors may have received intensive education, but the few hours of biochemistry studied cannot provide even a basic understanding of nutrition, let alone laying out the optimal diet. The fact is, eating healthy and managing weight should not be complex or difficult to understand. But because we live in a society where fast, highly processed food is so prevalent and many of the ingredients we read are unrecognizable, being able to make good food choices has become complicated. I believe the key to a long vibrant life is educating ourselves in what constitutes healthy or unhealthy at the cellular level. Weight-loss programs fail in this respect because they focus on only one component of health, weight control, which is a narrow-minded approach to nutrition. Obesity is unhealthy, but is just one of the many negative effects of the calorie-rich, addictive North American diet. A healthy diet not only promises good weight management, but will provide all the finest elements for a clean running immune system. It will supply us with protective antioxidants, detoxifying agents, essential and nonessential vitamins and minerals, anti-aging agents, fiber for a clean colon, enzymes to assist digestion, fluids for hydration, non-concentrated calories for energy, and a spectrum of as yet undiscovered secrets, all working to promote vibrant health for a long life. A truly balanced diet will mean finding in proper proportion the richest sources of all of the above benefits in the carbohydrates, proteins and oils we eat. And let’s not forget, it has to taste good too. Now that’s a diet I can sink my teeth into.